Baron De Forest (S. Y. Honor). 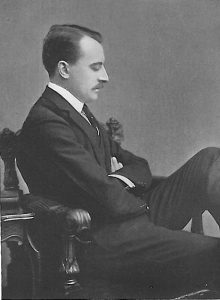 Was born in 1879, and educated at Eton and Christ Church, Oxford. He was Lieutenant of the Prince of Wales’s Own Norfolk Artillery Militia, and in 1903 transferred to the Staffordshire Imperial Yeomanry. He is owner of the Honor, one of the most magnificent steam yachts afloat. The Honor was built to Baron De Forest’s commission by Messrs. Ramage and Fergusson in 1905 from designs prepared by Messrs. G. L. Watson and Co. Her Thames measurement is 1,020 tons, and her length o.a. 229 feet 3 inches. She is con­structed to Lloyd’s highest class, and her internal fittings are carried out in lavish style. 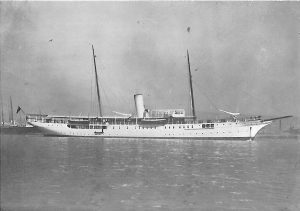 He was also the owner of the celebrated 52-footer Magdalen, which was built for him by Messrs. Fife, and won everything in her first season. 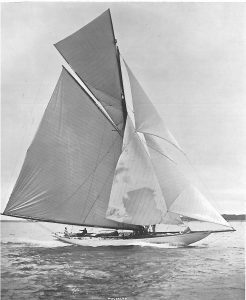 She sailed the best out of three races against the French yacht Esterel, to which the Coupe de France had been given on a technicality, and easily won the two races actually sailed. Baron De Forest married in 1904 the Hon. Ethel Gerard. Both the Baron and Baroness are fond of cruising, and the Honor is kept in commission during the whole year. Residence: Spencer House, 25, St. James’s Place, S.W.